We can change minds with words! In this unit, students will learn how to write essays to change their audience’s mind. They will learn to state the purpose or opinion, give smart reasons and offer solutions and a conclusion. Students will organize their thoughts with opinion and reasons on plan sheets. Students can sketch or write a reason to support their opinion. Great for ELL and students with special needs too. You could also use it for small group. Tip: Print with color and on one side. If you like what you see here, click the “Follow Me” button near the top of the page to get email updates about our store, new products, and sales! 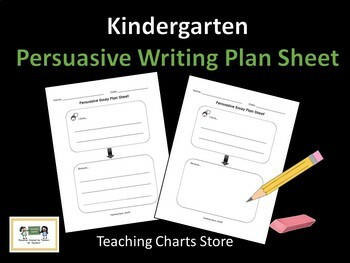 Or visit Teaching Charts store to check out our other reading and writing units. We are also on Instagram (teachingcharts) and Facebook (Teaching Charts)!